Climbed February 11, 2007 and October 9, 2011. How to get there: See the directions given under Mykletveitveten, 1131 meter. Route description: See the description given under Mykletveitveten. 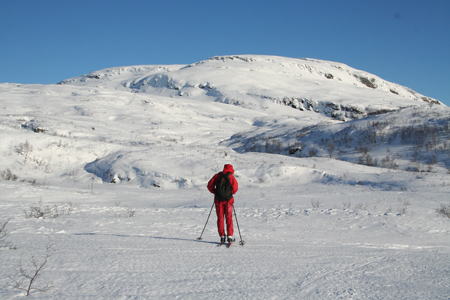 Comments: Pål Jørgen and I skied this mountain on our way back from Mykletveitveten. For more information, see the comments under Mykletveitveten. I had given a talk on mountaineering for the group of volunter guides of the Bergen Turlag after a nice hike to Storliknausen, on October 8th. Today, it was rather windy with rain. I decided to hike Hamlagrøhornet before returning to Bergen. Actually, I did not remember that we skied it on the way home almost 5 years ago. I set out at 0830 and made good progress up a wet and muddy T-marked trail. Arriving at the Kvanngjelet col, I decided to take a waypoint in order to safeguard my return hike. It was windy and snowing, additionally pretty dense fog/clouds made my visibility very poor. Horror! My goretex jacket had developed a hole in the chest pocket and my GPS had obviously fallen out. Now what to do? I decided to continue to the summit, the wind from the south seemed quite steady and I figured that it would be enough to facilitate my navigation. I climbed rather steeply, bypassing some cliffs, then into denser fog. It turned out that every little high point seemed to have a cairn. I hiked by several before finally hitting what I believe must be the summit around 0945. Complete white-out. I turned around and tried to backtrack by following my footprints in the snow. They soon vanished and I continued with the wind hitting the left side of my face. A bit interesting without compass and without GPS in pretty nasty conditions. I believed that I was going slightly more left (south) than on my climb, this turned out to be accurate. I discovered the steep west facing cliffs and had to follow the top going north until I intersected my footsteps. How likely to find my GPS on this return hike? I made a guess that I had about a 10 percent chance to see it again. Fortunately, about half way between the Kvanngjelet col and the Alexander Grieg tourist hut, I spotted the GPS quite close to the trail in a muddy section. I was back at the Alexander Grieg hut by 1045, told the people farewell and subsequently hit the road back to Bergen. 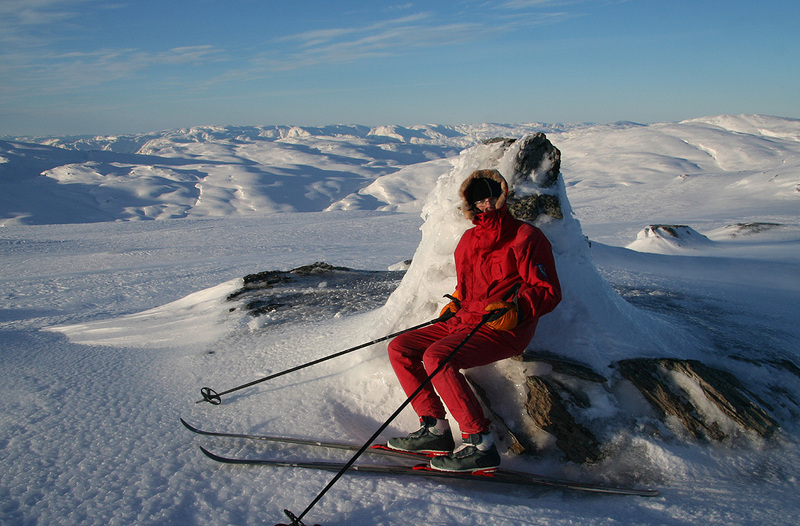 At the summit, Pål Jørgen has a brief rest.